The whole “put a ring (diamond) on it” thing terrifies most men, but this game is not about those kinds of diamonds. 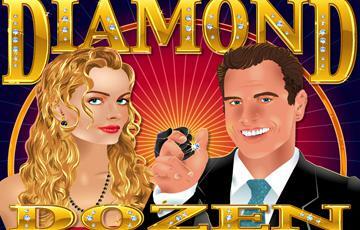 This game is about earning cash, diamonds and having fun. It is a romantic game, but there are no rules about engagements or promises. So rest assured and try it out! This game is part of the Real Series, which means that it has nice graphics, easy gameplay and lots of opportunities to bet how you like best. You can play for nickels or as much as you want. And, you can choose to play up to 20 lines for maximum action. There are two different bonus games. The first one is a straightforward free spin and the other one lets you pick diamonds to reveal prize multipliers. But you can’t really go wrong picking these diamonds. •	All symbols play left to right only, including scattered Blue Diamonds. An additional bonus game, the Diamond Delight Feature is triggered when you find 3 or more White Diamonds on any spin, whether in normal play, or in a free game. Just touch each diamond to reveal a number between 1 and 10. All the revealed numbers are multiplied by each other, then multiplied by your original bet to yield your total bonus prize. But don’t pay much attention to my jokes and play the game yourself. I can assure you that it will be lots of fun to turn diamonds into cash. Sparkling fun awaits!